What's Wrong With Common Core Math? The Common Core State Standards Initiative for Mathematics has been a subject of debate between parents, students, teachers and schools, ever since it went into effect in 2014. It involves changing and/or introducing new methods for solving mathematics problems. It was initiated by the National Governors Association (NGA) and Council of Chief State Schools Officers (CCSSI), to make sure that our K-12 students are where they should be at the end of each school year. The only way in which I can interpret, “where our students should be,” is that these councils are comparing the academic pace of our students with that of other nations. They adopted “The New Math” after the Russians beat us in the Space Race, and when that system failed, they reverted to the prior system and called it “Back to the Basics” (because "Old Math" didn’t sound very appealing.) And now, for whatever reason, they are changing it again. Our National and State Boards of Education have changed our system of teaching Mathematics every 20 or 30 years, dating back to the early 20th century. Most of these changes caused so much confusion, that they were eventually phased out, but because they had already been injected into the system, it took years before they were totally eliminated. And naturally, each change cost a great deal of money, most of which was spent on teaching teachers these new methods. Common Core Mathematics' first order of business was to introduce new methods for addition, subtraction, multiplication, and division, since these operations are the foundations of Math. Now...I'm quite proficient in Mathematics. I can come up with 100 different ways for adding, subtracting, multiplying, and dividing numbers, but I've determined that the best way to teach Mathematics is to teach the concepts, and then teach how to get the right answer as effectively and efficiently as possible. I’ve reviewed many of Common Core’s new procedures for solving problems, and objectively speaking, they are nowhere near as effective and efficient as the techniques that I (and most other educators) have taught over the past couple of generations. I find it hard to believe that the only solution for getting us caught up academically with other nations is to change our techniques for solving math problems. If I had a say in this matter, I would spend that money on improving the way in which our teachers teach our existing methods, rather than changing the methods. Interestingly enough, according to the Department of Education, “…there has been no significant opposition to (Common Core's) implementation.” I don’t know how they arrived at that conclusion, but 100% of the parents whose kids I’ve had the pleasure of tutoring, adamantly oppose Common Core’s methods. I'll say that again...100% of my clients whose kids have had to deal with Common Core are baffled and agitated by its existence. Five years ago, I wrote that the High School Proficiency Exam (HSPE) made no sense (see High School Grading Structure Defies Logic), and since then, The Nevada Board of Education has phased it out. Hopefully, it won’t take as long for them to rid us of Common Core. 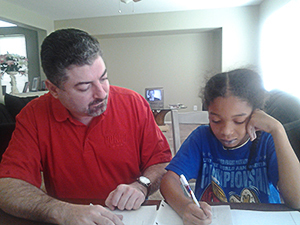 Tutor Pros of Las Vegas NV provides tutoring in all subjects K-12, specializing in Math up to and including Algebra and Geometry, as well as Criterion Referenced Test (CRT), Scholastic Aptitude Test (SAT), American College Testing (ACT), College of Southern Nevada (CSN) placement exam, and Test of English as a Foreign Language (TOEFL) preparation. Pricing is flexible and affordable--call today to discuss the specific needs of your child.